I love YA sport romances, and The Rules series has actually been in my TBR for a while. 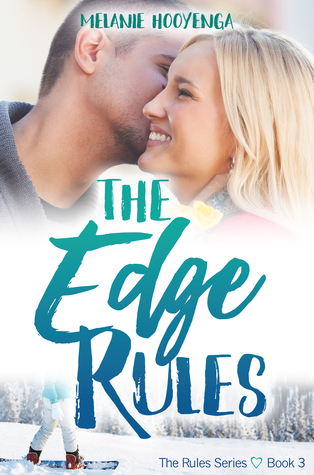 Even though I haven’t read the first two novels, I’m excited to be a part of the blog tour for the third novel, The Edge Rules! Brianna was the mean girl everyone in school was afraid of before she fell from her queen bee status. I haven’t read the two previous books in the series, but I believe Brianna was the antagonist to the main characters in those books. The Edge Rules begins after Brianna has already lost all of her friends and her popular status at school. Spiraling from what’s happened, she’s turned to shoplifting…until she’s arrested. Things go from bad to worse when she finds out her parents are divorcing that same night. Brianna’s sentenced to community service, which she fulfills through picking up trash on the side of the road. Through this, she meets a whole cast of characters she would not be caught dead socializing with in her past life and realizes they aren’t so terrible as she might have once thought. It’s not often that I read a book where the main character is the mean girl, and I really enjoyed this aspect. I loved watching Brianna grow from her mean girl persona into a better person and actually learn from her mistakes and past. I think if I had read the other two books I could appreciate this growth even more. While it’s not required to read the other books, I would recommend doing so in order to understand the whole picture. I plan to go read the other books soon and then do a reread of this one. I loved seeing Brianna interact with the different members of the clean up crew as she got to know them better and as she herself started to change. Even though everyone comes from different backgrounds, they all share a lot of similarities, which Brianna comes to realize as she forms real friendships. I also loved seeing Brianna’s relationship with Xavier develop, especially when he teaches her how to snowboard! Overall, I really enjoyed The Edge Rules and I look forward to reading the rest of the series! This book sounds awesome. I love sports romances too. Definitely need to read this series! I really want to read the rest of the series now! I’m so glad you liked this book!!! I kept thinking you should read this series, it’s the kind of books you like!! I hope you’ll get a chance to read the first two!!!! Melanie is local to me and ever since I met her a couple years ago, I’ve been a big fan!!! Thank you, Theresa! I’ve definitely seen you post about this series before, so it’s been on my radar! I can’t wait to read the rest of the series! I enjoyed this book. It was a great redemption story, and I liked that it was left a little messy at the end. The romance was fabulous too. I loved the redemption aspect! YA sports romances have been my latest obsession 😛 I’ve seen this series around so I’m so happy to hear you enjoyed it! I like that it focuses on alpine sports. So often it’s hockey (which, I’m Canadian so I’m always cool with that) but it is refreshing to get a different sport in there! Thank you! What are some of your favorite YA sports romances? I’m always down to read more!